In what is easily already the most adorable story of the year (aside from scientists discovering that bees make a 'whoop' sound when they get startled), a 7-year-old girl named Chloe Bridgewater recently wrote a letter to Google's head office asking if she could work there. This was inspired in part by Chloe's interest in all things computer (and robot) related, but also because she liked the idea of working in an office which is essentially a gigantic playroom with bean bags, slides and go karts. 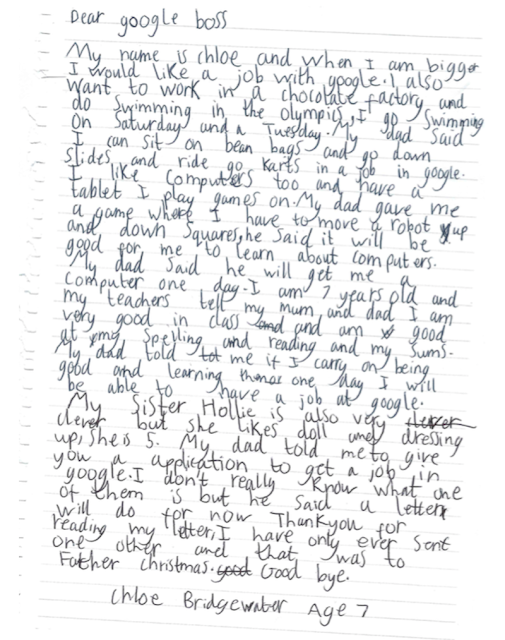 According to the letter, she also intends to work at a chocolate factory and swim in the Olympics, so Google is clearly just a stopgap. Even bearing that in mind, the response she got was amazing. 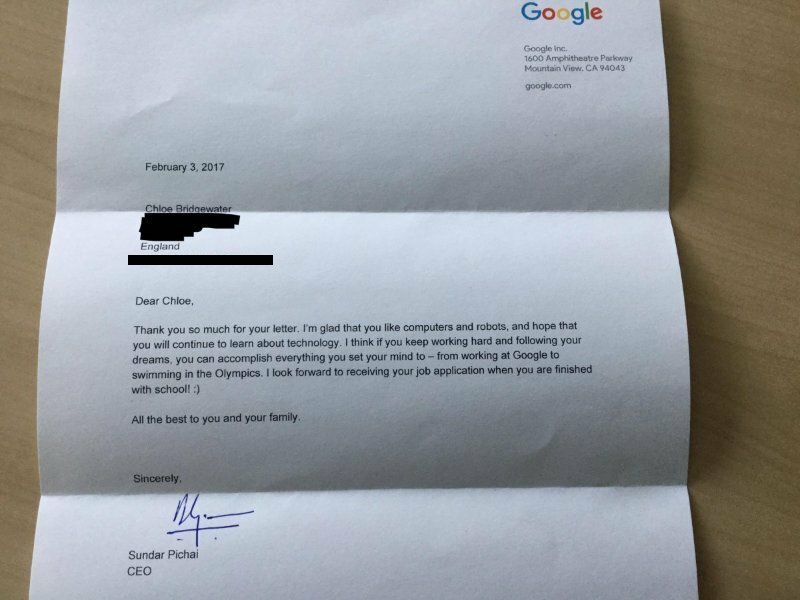 Not only did Google send her a letter back, but the letter had been personally written by Google CEO Sundar Pichai. In it, Pichai tells her to keep following her dreams, and that he looks forward to receiving her full application when she's "finished with school". He even put a smiley face at the end. Chloe had been encouraged by her father to send the letter, after she'd asked him where he would like to work most. Naturally, as many of us do, he said Google, and that's what sparked off the whole thing. After receiving the letter, and presumably taking a few minutes to calm himself down, Mr. Bridgewater posted it on LinkedIn. 10 million views later, the term 'viral' was starting to look like an understatement. 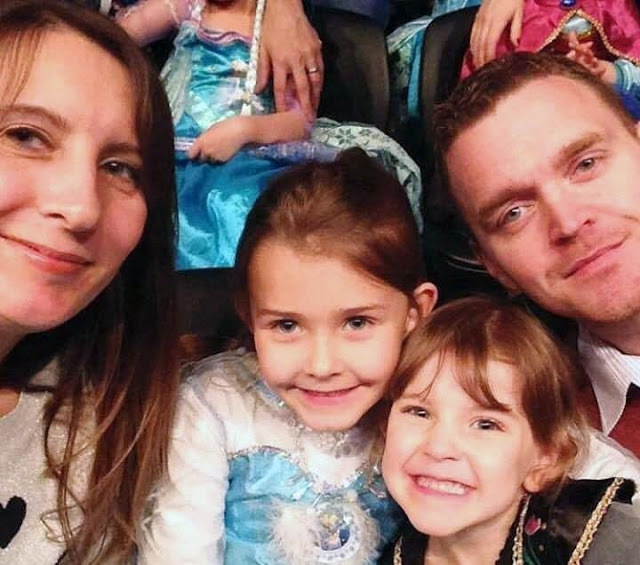 In the wake of all this fan fair, Chloe has now apparently decided that she wants to get a job at Google through media recognition, though her father has said he'd rather she focused on school, naturally. In either case, being told directly by one of the most influential people on the planet to follow your dreams has got to be a strong motivator.